It has been two weeks since the “Getting Started” article was published so it is time for a progress report. I have a good bit of information and data to share from the past two weeks and I am going to do my best to present this material in an orderly and usable manner. As with any article based mostly on collected data this could read a little dry but I will try to keep it entertaining as well. Looking at a scale on a daily basis can not only be disappointing but can also have a negative impact on your attitude towards what you are trying to accomplish. 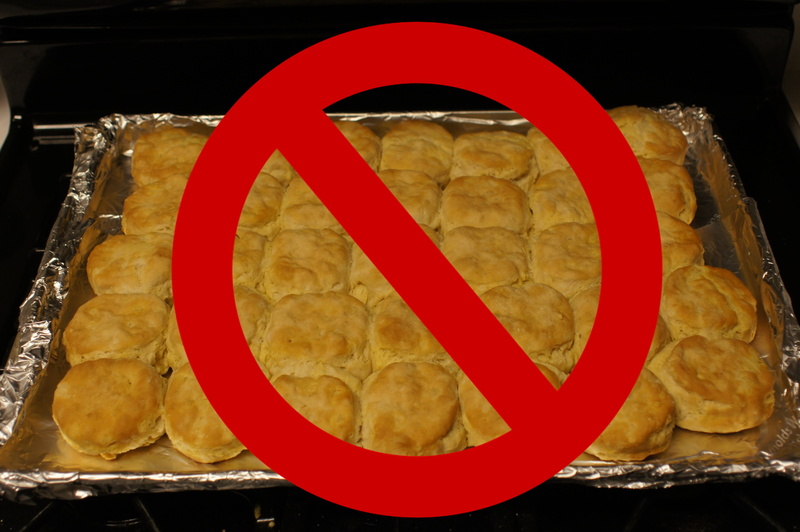 My advice is….DON’T! I will be the first to admit it can be hard when you are really monitoring your diet and pushing yourself hard with exercise to ignore the scale but the differences in daily weight will be minor and honestly the little difference can also fluctuate based on when you weigh and even what you ate the night before. My advice is weigh once a week and try to do so at the same time each week. First thing in the morning is when I choose. 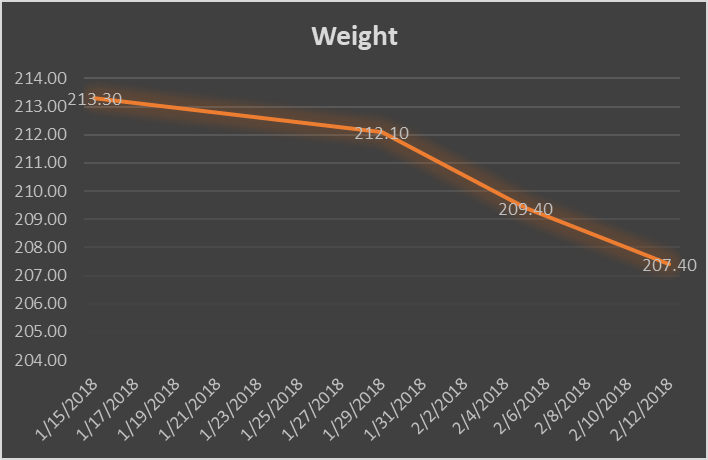 Below is a graph of my weekly step onto the scale, always on Monday mornings an starting on the same date as was mentioned in the getting started article, January 15th, 2018. As I mentioned in the earlier article this does include one week of a severe cold, or the flu so not much happened Week 1. This chart will be updated with each status update and posted here. In the future I will be adding waist measurement as well. Last note, if combining exercise and diet you will be gaining muscle as you lose fat, so weight loss may seem less than anticipated but this is a good thing!! So just be sure to keep that in mind if you begin tracking your own progress. The good news is, if you work harder during your daily exercise you can choose to eat more and still show positive results. I can honestly say there have been very few times over the past few weeks that I have been or felt “hungry”. Before you continue I want to reemphasize what I have stated before (and will probably continue to do in each post. I am NOT a dietitian nor am I am professional trainer. Everything I am doing is based on my own research. I STRONGLY advise you to do your own in addition to what you read here. If you would like to review my diet for the week ending February 3rd, 2018 you can view that by clicking here. You can view the week ending February 10th, 2018 by clicking here. Regarding exercise, I take one “rest day” each week although even on the day of rest I still shoot my bow 30-50 arrows that day and I may go for a light walk….a mile or so. The other days I am doing a mix of walking, running, rucking and cross-fit/HIIT exercises. For now you can get the high level of what my routine was for the week ending February, 3rd 2018 and the week ending February 10th, 2018. In a future post I will outline how I am modifying my routines from what I outlined in the “Getting Started” post. These modifications include adding weight, increasing duration or modifying the sequence of exercises. That’s all for now, look for an update two weeks or so from today and in the meantime, if you choose to use this series as encouragement to get yourself in better hunting shape please share your story and your success either by commenting on this post or by contacting us on Social Media. Great info. Keep them coming. And something I realized on my personal journey through exercise and keeping fit for hunting, is to make working out a part of my daily routine year round. It’s a heck of a lot easier to maintain a decent level of fitness year round. It’s much harder to get in shape for the season, then slack off, then start over again. I used to be able to pull it off when I was younger. I’m in my fifties and it’s not so easy to do that. I work out 5 days a week and take the weekends off. And even on the weekends I do something active. I might step it up a bit if I’m going out west or to Alaska, but in general my 5 days a week/year round keeps me in shape for whatever I want to do. And I just feel better in general. This works for me. Figure out something that works and stick to it! Great input Karl. This year I have really tried to keep from reverting back to old habits of eating poorly and lack of activity. I did not exercise daily during the season but was getting a good bit of exercise while hunting. Once season ended and the holidays were behind me though I jumped back into it. Keep the comments coming and please share with any one you think may benefit from reading and following along.